Bunches of daffodils are available for sale in shops and supermarkets everywhere. Flowers by post from Cornwall and the Isles of Scilly are in peak production. Support this important British industry and cheer yourself up at the same time. 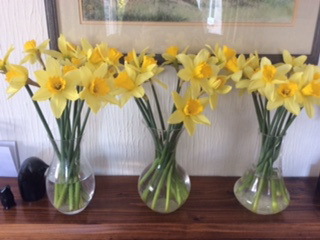 There is nothing like a few vases of daffodils to brighten up wintery cold and grey days.